an adopted baby's photo album. 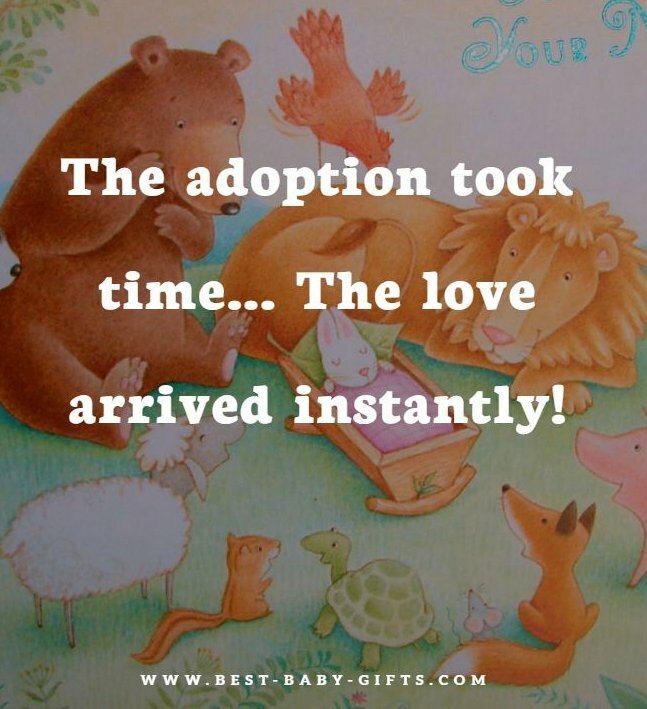 This adoption messages are also great as a wall art / wall decoration in an adopted baby's nursery. In addition, at the bottom of the page you'll find some unique gift ideas for adopted babies and children. Bound by love. Joined by hearts. Sent from heaven. A gift from God. You may not have my eyes or smile but from that very first moment you had my heart. Adoption is when a child grows in his mommy's heart instead of her tummy. Adoption spells: Amazed. Delighted. Overjoyed. Proud. Tickled. In 7th heaven. On Cloud Nine. Never Happier! Parenthood requires love. Not DNA! I didn't give you the gift of life. Life gave me the gift of you. Adoption is: Love. Commitment. Courage. Family. Charity. Adventure. Happiness. A wonderful experience. And so much more! 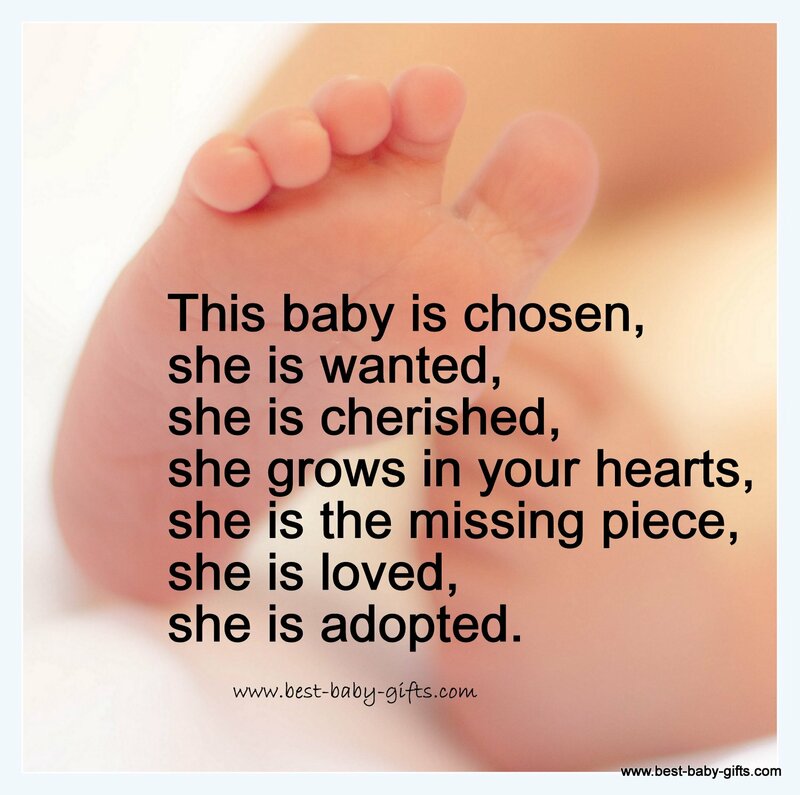 This baby is chosen, she (replace by he if it's a baby boy) is wanted, she is cherished, she grows in your hearts, she is the missing piece, she is loved, she is adopted. Wanted - Chosen - Adopted - Loved. Adoption helps put love back into a child's life. This baby wasn't expected, he/she was selected! Some things are absolutely worth the wait. Adopting a child won't change the world but for this one child and couple the world will change. The adoption took a very long time and patience - The love arrived instantly. Not flesh of my flesh. Nor bone of my bone. But still miraculously my own. Never forget for a single minute, you did not grow under my heart but in it. Adoption. Born in your hearts. United by love. We adopt not because we are rescuers but we are the rescued. I may not have carried you for 9 months but I will spent the rest of my life loving you, protecting you and doing whatever I need to make you happy. Do you know any more inspirational adoption quotes to complete my list? Feel free to leave a comment in the box at the bottom of this page. Cute poem for an adopted baby girl. With regards to writing an adoption congratulations card, why not write what you'd write for a biological baby, too! Such as for example: "Congratulations and a very warm welcome to (name of adopted baby / child). May your new family be blessed with good health, love and laughter." Here you'll find many more sample messages for your baby congratulations cards. 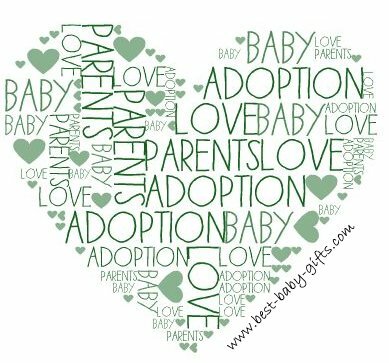 Complete your wishes by adding one of the adoption quotes above or use one of these for your cover text. Sometimes you might need to adjust the 'I form' into the 'you form' to make it work. I have a few cute and thoughtful ideas if you want to give the adopting family a gift. If the family has adopted a baby you can gift basically everything you'd gift for a biological child, too. Such as care products, a diaper cake, a baby blanket, a cuddly toy or other baby items. Simply browse my website's other pages to see lots of practical, cute and unique ideas. The sitemap will help you to find your way. 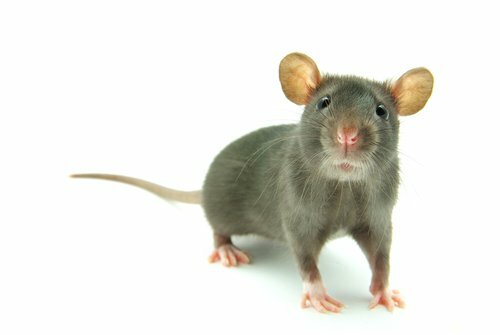 How about adopting / gifting a hero rat? I love and support this foundation and program ever since I heard about it. And this is just a unique and perfect gift idea for an adopted baby or child. Adopt (just finance it, you do not have to take the rat into your home) a HeroRAT and help to save lives! I just briefly explain to you what it's about, please get all information and make your adoption via the link to Apopo's homepage provided below (this is no affiliate link, I will not earn any commission).